Studio Fuksas unveiled their first airport design in 2013, a new Terminal that will facilitate the travels of 43 million passengers every year. The Terminal dubbed Terminal 3 at the Shenzhen Bao’an International Airport in Shenzhen, Guangdong, China will more than double the capacity of the airport with its massive floor area of 500,000 sq.m. 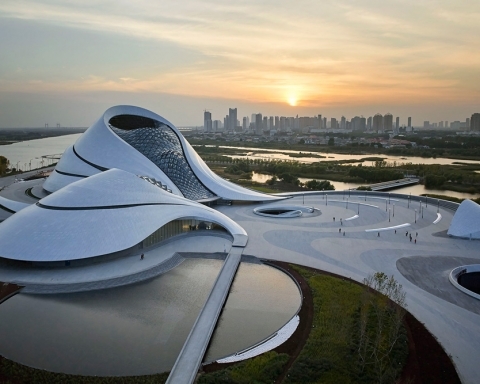 The concept of the plan for the airport was inspired by a fish, the manta ray, which breathes and changes its own shape, undergoes variations and turns into a bird to celebrate the emotion and fantasy of a flight. The airport has been created in the mold of an organic form and plan, both showing how strongly nature has inspired the design. The structure of the terminal evokes the feeling of a sculpture organically shaped and modeled by wind. The Terminal is a 1.5 km-long tunnel with a roofing profile that varies in height at various points to emphasize the height-changing natural landscape. A double layered skin inspired by the honeycomb motif wraps the structure with numerous skylights letting in natural light. Consequently, the Terminal 3 is well lit during the day with the honeycomb-motif openings on the roof creating variations and effects of light to make an interesting interior space. The large Terminal 3 ‘tail’ accommodates the entrance from which passengers ascend to various spaces. The ground floor allows access to the luggage, departures and arrival spaces. Other areas on the ground floor include houses, restaurants, offices and business facilities. The interiors of the terminal feature white cylindrical columns that rise to touch the roof, with shorter, chunky, tree-like air-conditioning vents sitting between most of the support columns. The space is characterized by numerous double and triple-volume spaces which according to the architect serve the purposes of establishing visual interior connections between levels and acting as a passage for natural light to filter through darker spaces. The architects designed for a key area within the airport from which everything begins; the concourse. It has three levels which are dedicated to three independent functions made up of departures, arrivals and services. The form was designed to create a cross, which is the intersection point where the three levels of the concourse are vertically connected. The vertical connection creates large triple volume spaces that allow natural light from the skylights on the roof to the lowest levels of the waiting rooms on the ground floor. The Terminal 3 at Shenzhen Bao’an International Airport is an impressive work of architecture by Massimiliano Fuksas and his wife, Doriana Fuksas. The tubular design of the terminal shows that people are in motion and hence everything in the development chases the idea of motion. The interiors replicate the honeycomb motif on the exterior. The solid stainless steel finish inside the airport just serves to multiply the motif on the internal skin especially on the ceiling. For the architects, organic was the way they chose to go for this terminal, and it reflects all around including on the white short tree-like air conditioning vents. It’s a case of all-nature and no going back.